U.S. consumer safety experts are being urged to better monitor use and harm of the tens of thousands of Segways in use nationwide. A day after the new owner of the Segway company plunged to his death on one of the two-wheeled scooters, Washington, D.C., emergency room researchers are warning that injuries from the transporters are becoming more common — and more serious. People hurt on the self-balancing devices are more likely to be admitted to the hospital, particularly with traumatic head and face injuries, said Dr. Mary Pat McKay, a professor of emergency medicine and public health at the George Washington University. She’s urging U.S. consumer safety experts to better monitor use and harm of the tens of thousands of Segways in use nationwide. In a case review released today in the Annals of Emergency Medicine, McKay counted 41 Segway injuries among patients who came to the George Washington emergency room between April 2005 and November 2008. Of those, 10, or 24 percent, were admitted to the hospital and four were rushed to the intensive care unit. “When I compare admission rates for Segway injuries for people who came to the ER, the admission rate was higher than pedestrians struck by a car,” she said, noting that about 20 percent of those patients are admitted. Victims suffered massive facial trauma, brain injuries and serious fractures of clavicles, ribs ankles and arms. No one died. Most simply fell off the devices, typically when they encountered an immobile object such as a bench or a pole, McKay said. 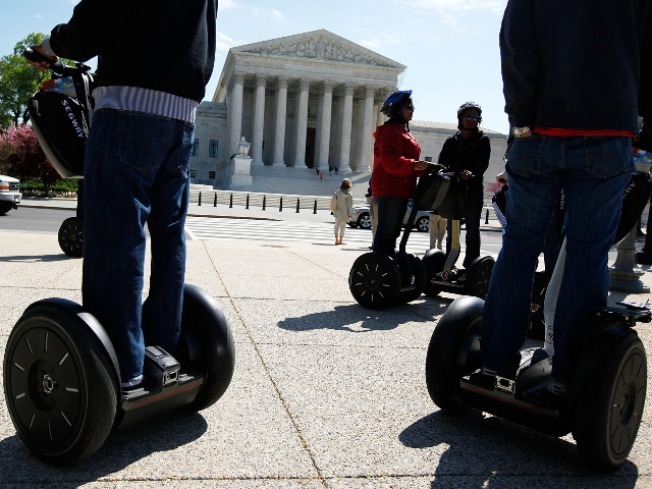 Seventy percent of those hurt were visitors to the D.C. area, including many who tried Segways as part of guided sightseeing tours, the study found. McKay’s study was completed well before the death of Jim Heselden, the 62-year-old British businessman who bought the Segway company less than a year ago from U.S. inventor Dean Kamen. Heselden apparently died after falling off 30-foot cliff Sunday while riding a rugged all-terrain Segway near the River Wharfe in Yorkshire, England. Reached early Monday, McKay said it was too soon to tell whether Heselden’s death was a result of safety problems with the Segway itself, or some other reason. A spokesman for the Segway company reiterated that the details of the situation involving Heselden remained unclear, but that Heselden believed strongly in his new venture. “He had a great, profound love of the product,” said Matthew J. Dailida, vice-president of government affairs and business development for the Bedford, N.H., firm. “We believe greatly in the safety of the product when used according to our user guidelines,” Dailida added. The privately held firm does not release the numbers of Segways sold, Dailida said. Some estimates put the number of Segways in use at about 80,000 worldwide. Dailida would only confirm “tens of thousands” had been sold. McKay acknowledged that her study was very small and that 41 injuries were a tiny fraction of George Washington emergency visits that total 49,000 to 63,000 a year. However, she said researchers were surprised to see how many Segway accidents resulted in serious injury. McKay wants the U.S. Consumer Product Safety Commission to add an emergency code that would allow emergency rooms across the country to specifically track Segway accidents. However, CPSC spokesman Scott Wolfson said the agency can’t add a category for brand device, but must instead monitor broad categories of use. Segways are now included in the same injury category as four-wheeled motorized scooters. Wolfson noted that CPSC has monitored the devices sufficiently to issue recalls when warranted, including a recall of 23,000 Segways in 2006. “The attention by the agency has been to make sure that it performs as expected,” Wolfson said. McKay said her study showed the importance of wearing helmets when using Segways and of making sure to carefully monitor the environment while riding the devices.